Our publication about „1×1 Trainer with Handwriting Recognition“ got published in the International Journal of Interactive Mobile Technologies (iJIM). We described our successful app, which has been firstly announced already here. Nowadays, computers and mobile devices play a huge role in our daily routines; they are used at work, for private purposes and even at school. Moreover, they are used as support for different kinds of activities and task, like for example, learning applications. The interaction of these applications with a computer is based on predefined input methods, whereas a touchscreen facilitates direct input via handwriting by using a finger or a pen. This paper deals with the invention of a mobile learning application, which is supposed to facilitate children’s learning of simple multiplication. The aim of this paper is to collect the data of children’ experiences using interactive handwriting on mobile devices. In order to gain this data, a school class of the school “Graz-Hirten” was tested and afterwards for evaluational purposes interviewed. The results of these usability tests have shown that children perceived handwriting via finger on screen as quite positive. Im Rahmen seiner Masterarbeit hat sich Michael mit der Handschrifterkennung beschäftigt und zwar für den 1×1-Trainer. Damit ist es nun möglich die Zahlen mit dem Finger/Stift einzugeben. Es freut uns ankündigen zu können, dass wir nun auch einen 1×1 Trainer für den iPad anbieten können. Mit Hilfe eines kleinen Pandas dürfen die Rechnungen eingegeben werden. Zusätzlich ist es so, dass wenn man einen Account in unserem Learninglab besitzt, wird alles mitgespeichert und damit die Rechnungen abgestimmt auf den Lernstand. 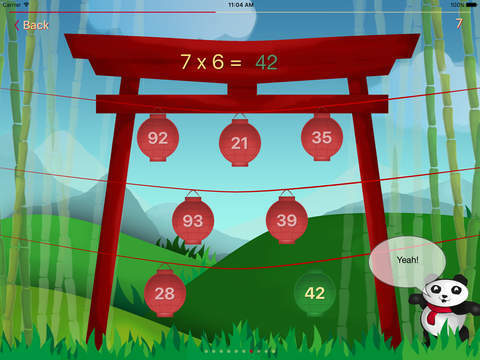 This App is supposed to help children with learning multiplication tables up to ten. It is possible to create an account for tracking your success. If a registered user is playing, problematical calculations are tested more often. There are three difficulty levels and two different modes. In one of the modes the correct result has to be entered by numerical buttons and in the other one the result has to be chosen from seven numbers. The friendly assistent Paul the panda is commenting your learning sessions. Mein Vortrag im Rahmen der OPCO Veranstaltung zu Learning Analytics steht mittlerweile auch als Aufzeichnung zur Verfügung. Ich stelle dabei auch unseren Mathetrainer vor. Viel Spaß beim Ansehen und ich freu mich wie immer über Rückmeldungen. One of the first and basic mathematical knowledge of schoolchildren is the multiplication table. At the age of 8 to 10 eachchild has to learn by training step by step, or more scientifically, by using a behavioristic learning concept. Due to this fact it can be mentioned that we know very well about the pedagogicalapproach, but on the other side there is rather less knowledgeabout the increase of step-by-step knowledge of the schoolchildren.In this publication we present some data documenting thefluctuation in the process of acquiring the multiplication tables.We report the development of an algorithm which is able to adaptthe given tasks out of a given pool to unknown pupils. For this purpose a web-based application for learning the multiplicationtable was developed and then tested by children. Afterwards so-called learning curves of each child were drawn and analyzed bythe research team as well as teachers carrying out interestingoutcomes. Learning itself is maybe not as predictable as we knowfrom pedagogical experiences, it is a very individualized processof the learners themselves.It can be summarized that the algorithm itself as well as thelearning curves are very useful for studying the learning success.Therefore it can be concluded that learning analytics will becomean important step for teachers and learners of tomorrow. Der 1×1 Trainer wurde programmiert und das Erlernen des 1×1 gezielt zu unterstützen. Der entwickelte Algorithmus passt sich an die Leistungsfähigkeit des jeweiligen Kindes an. Damit ist möglich das Lernen sehr individuell zu gestalten und seitens der Lehrpersonen gezielt zu intervenieren. Hinter diesen Überlegungen steckt das Schlagwort Learning Analytics und im Workshop soll gezeigt werden, welches Potential hinter der Anhäufung und Auswertung vieler gewonnener Daten steckt. Gegenüberstellungen, Mängel und Stärken werden so schnell sichtbar und helfen der Lehrperson Unterricht gezielter und individueller zu gestalten. Mobile Learning hat Potentiale die es gilt zu nutzen und zu entdecken. Die detaillierte Beschreibung des Workshops findet man hier. Wie immer freuen wir uns auf den Besuch, eine aktive Teilnahme und Rückmeldungen 🙂 .